Give2Attain: Obama: My Way or Else !!! It seems long ago, but I think it was just last December. Obama was holding the Congress hostage to force them to let the taxes increase on the "rich", or he would not allow the other "Bush Tax Cuts" to continue. Finally for the good of the working American's they caved and let the tax increase occur. How is this similar and different to what the Congress is doing? What else could these folks do to resolve this problem? Are the President's "Congress Bashing" and disaster threats healthy for the country? Is the shutdown affecting you personally? How? FOX News Can we do without it? FOX News What Shutdown: Huge or Hype? I don't know how what happened in December should affect what's happening now. In any event, Obamacare was enacted in 2010 as a result of a series of compromises. It's a done deal. Republican legislators want to go back on that deal now, and I see no reason why the should be allowed to do that. Among other things, concessions were made to get the deal we have now. Republicans seem to want to reopen the deal, but they don't seem to want to give back the concessions, a case of what's mine is mine, and what's yours is negotiable. This is not to say that we shouldn't be willing to address specific problems raised by Obamacare. When Republican legislators withdrew from the discussion, they left a lot of their constituencies unrepresented, who were hurt by that. I think it would be great to take a second look at the needs of those consituencies. I am pretty sure Obama has no desire in working with the Republicans to "fix Obamacare" unless he is pressured to do so. Thus the stalemate and rock throwing that we are currently seeing. Obama seems willing to take a lot of "Presidential Actions" to tweak the program and its implementation, however collaboration does not seem to be his gift. The executive branch always has to take a lot of actions to implement law. Nothing new there. What happened in December was of a completely different stripe than today. There was no risk of government shutdown or default like today. However it was extortion by holding the middle class tax rate hostage. Personally the loss of the middle class tax cut would have had more impact on me than the government shutdown. am pretty sure Obama has no desire in working with the Republicans to "fix Obamacare" unless he is pressured to do so. I am just as sure he is. As Nancy Pelosi once pointed out, you don't really know what's in a bill until you pass it, and we are going to find out a lot about Obamacare and what needs fixing in the coming weeks, months, and years. The process of doing that would be much smoother with Republican participation. Of particular concern to me is problems of small business. I view "Presidential actions" as part of the checks and balances the constitution wisely contemplated when it created three independent branches of government. If you were the GOP, how would you get the President to actual collaborate? Try winning elections instead of losing them. If the Conservatives are the bad guys who have kidnapped Obama's baby and are demanding payment. Who is worse? The kidnappers or the parent who will not pay the ransom, therefore allowing harm to come to their child? I hope my Dad would pay my ransom, and put my needs above his money and ego... Though I am thinking he may have this one thing in common with Obama. I don't recall a govt shutdown or threats to default on our debt. Does one of your links explain how Obama held congress hostage? I don't get your point or your comparison. "Obama took multiple shots at Congress for its clumsiness in negotiations and insisted that he'd demand more tax hikes if the legislative body used the impending debt ceiling standoff to demand spending cuts." Now I understand that you see shutting down the Federal Gov't as a bad thing, but I see using tax rates as much worse. In case you don't remember the details of what that entailed. He held the tax cuts for 99% of us hostage until the GOP caved... This would have really hurt the low income folks. However thankfully the GOP gave in. It seems Obama and the GOP both wanted to keep the lower tax rates for most people. Only the GOP wanted to keep the lower tax rates for the wealthy, so they did what they agreed upon. I think it was the GOP that initially set an expiration date on the lower tax rates, so Obama did nothing in letting the higher rates for the wealthy take effect. I still don't see a hostage in this very normal negotiation. Also, that tax increase helped to make a significant reduction in the deficit, which should be something you approve of. Personally I would have been happier if they had let all the Bush tax cuts lapse. You know how I am not a big fan of government enforced wealth transfer. And I think if one group is going to be forced to pay more, then we all should chip in. Though I do agree it is good to see the deficit falling. So how is that "negotiation" different than the GOP refusing to pass a funding bill until some cuts are implemented? One of which being delaying Obamacare by a year. I agree that they will need to raise the debt ceiling. However "shutting down the government" because it is too costly seems like fair game to me. Obama is the one -- not Republicans -- who has offered a "Grand Bargain" that demands sacrifice from both sides. To the chagrin of many Democrats, he offered cuts to Medicare and Social Security. Republicans want the cuts to those programs without offering any compromise on tax rates. I went to Target this morning and offered to negotiate the price of a tube of toothpaste. They refused. I wonder why. The GOP let taxes rise for the wealthier Americans. What additional taxes do the Democrats want before they start seriously dealing with the government "over promising" problem? Thoughts? 3Leverage does count in negotiations. Obama isn't negotiating because the Republicans have no leverage. No leverage... Apparently it isn't important to get the government running again then. I personally am not missing it yet. See, if you could shut down Target, they may give you a discount on the toothpaste. They would see that their ego and the $1.00 were not worth the business shutdown. (ie lost revenues/profits) Apparently Obama thinks differently. Remember: I am not on either side in this one. I just find it amusing that both sides are pointing at the other side. And their supporters are right there with them. The reality is that either side could end this at any time, but egos are very powerful. Especially when the whole world is watching and judging you. You should read more carefully, John. Per your HP link, Obama made remarks and the GOP made threats to blow up the deal. Threat making seems to be from the GOP play book. My world does not consist of only people with black and white hats. I see lots of real humans with hats in different shades of gray. Sometimes some people are wearing black hats, which to you always seem to appear gray. The first link's author may be suspect / biased. Checkout his back ground. "James Fallows is a national correspondent for The Atlantic and has written for the magazine since the late 1970s. He has reported extensively from outside the United States, and once worked as President Carter's chief speechwriter." - Of course the Democrats could offer something to stop this, Liberals would not like it but it is easily done. (ie delay Obamacare and cut spending) So James is incorrect in bullet 2. - Bullet 3 sounds a bit judgemental of his peers. Was this news or an opinion piece? Link 2: This makes perfect sense to me and I agree it is likely absolutely correct. Assuming the Democrats / Liberals support more government spending to help the citizens of the USA and to stimulate the economy, when or why would they ever balk at a debt ceiling increase? Besides remember that we are in uncharted waters. The last time Debt to GDP was this bad was in 1946 after WWII. And we were facing no where near the entitlement crisis that we are now. Do we take our chemo or live with the cancer? No leverage... Apparently it isn't important to get the government running again then. The way to get the president to the negotiating table is to offer him something he wants. How about a public option for Obamacare? I suppose Target may give you a $1 off if you promised to spend $10,000 additional in their store this month. To the GOP that would be like offering the public option. Good point. So are you agreeing then that apparently Obama would care more about the public option than getting the gov't going again? 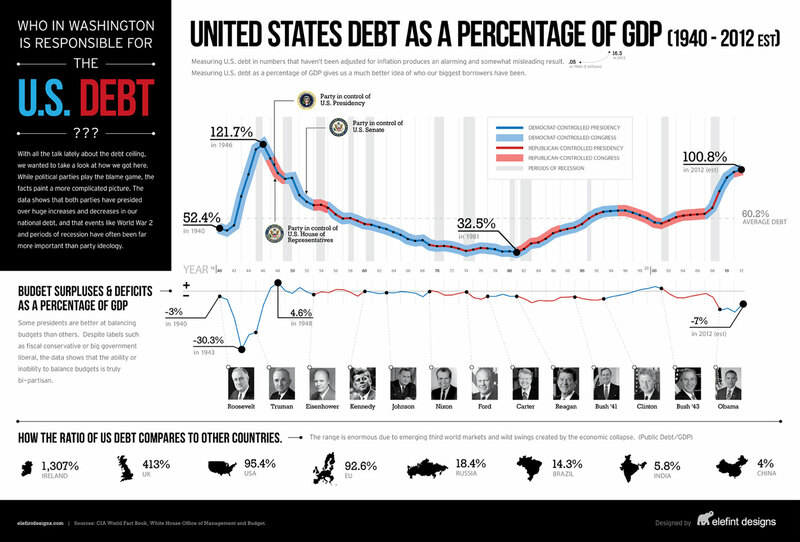 The debt chart is interesting, though I don't understand the middle part with the pres pictures. Obama care will not be delayed. This shutdown will end when JB allows a vote and 20 sensible repubs join the dems in passing a CR. To stop Obama care they should have won the 2012 election. About the deficit, The GOP needs to be willing to make a big compromise (increase revenue as well as cut spending) to make a major reduction in the deficit. I don't see that happening. I think we may be headed to some sort of economic crisis over defaulting on our debt. The US will not default on its debt. That's the boogeyman trotted out by demagogues like Obama and believed by the "low-information voters" that put him in office. Only about $400 Billion per year goes to service on the debt, and tax revenues are MORE than adequate, by far. (The IRS takes in that much every two months.) There is enough left over to pay the military, pay out Social Security and Medicare and in fact almost ALL of the "necessary and essential" functions of the federal government B.O. (before Obama). What there is NOT adequate revenue for is for spending in excess of that revenue (obviously?) which is deficit spending, adding to the debt and requiring that increase in the debt ceiling that Senator Obama said was irresponsible and a "failure of leadership." It's seems that "my way" has changed a lot now that HE is the "leadership."